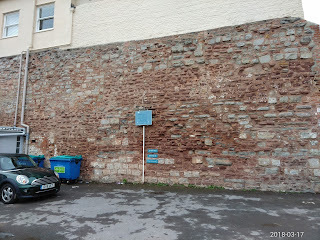 Sadly only scant pieces of masonry remain to illustrate this castle. 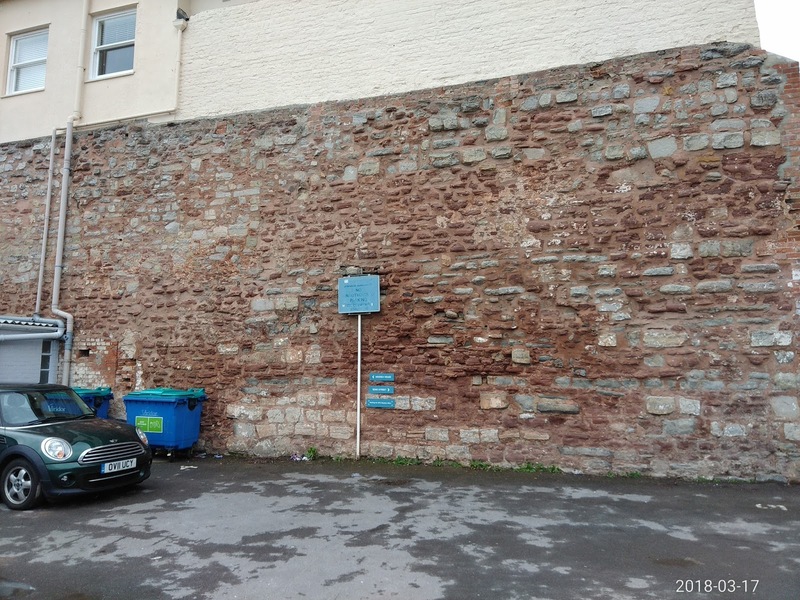 The main visible piece of material,can be seen on West Quay (the West banks of the River Parrett) As shown below, this seems to be a section of curtain wall, standing some twenty feet tall or so, and approximately fifty feet long. Above. The portion of 'curtain wall' visible from West Quay. There is some doubt that this is actually part of the curtain wall, and rather the remains of a walled garden contained within the castle grounds (contemporaneous or not with the castle) The curtain wall would most certainly have been in this general area, as the river at some point, came right up to the castle's walls....hence the Water Gate...the remains of which can be found in the grounds of nearby properties. The Water Gate would have provided direct access to the Castle from the River. The castle was most likely built in 1202 by William de Briwere, a wealthy businessman and Judge who rose to prominence during the reigns of King Richard I, King John and King Henry III. Most of William's wealth was generated by his vast estates which he acquired from his role as Sheriff of Devon and from his role as Justiciar to King Richard I, a role that required him to administer the Kingdom whilst the King was away on the Third Crusade. During King John's reign, William was granted the titles of Sheriff of Berkshire, Sheriff of Cornwall, Sheriff of Devon (again), Sheriff of Hampshire, Sheriff of Nottinghamshire and Derbyshire, Sheriff of Oxfordshire, Sheriff of Somerset and Dorset, Sheriff of Sussex and Sheriff of Wiltshire. He was not a particularly 'liked' Sheriff in several of his domains, and at one point, fees were paid to the King for his removal, by the people of Cornwall, Somerset and Dorset. His character and ruthless pursuit of land and tax probably lay the foundations for the creation of the Sheriff of Nottingham in the tales of Robin Hood. Above. 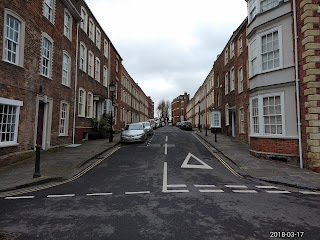 A view up Castle Street. Historical descriptions of the castle tell us that it was well equipped; with two bailey areas....an inner and an outer (possibly built after the castle was raised and the requirement for functional buildings outgrew the inner bailey area) a large keep located in what is now Kings Square, a chapel dedicated to St Mark, Mortemere's Hall, living quarters, stables, kitchens, a bell tower and a dovecote. The castle is said to have been built on the river's edge in order to control the shallowest crossing.....with the Water Gate opening out onto the river itself. William died in 1226, and his son, to whom the castle passed, died a few years later in 1232. The castle and estates then passed to the Crown, with it being reduced to a store and prison. Between 1242 and 1246 repairs were made to the keep and some of the towers. The castle then passed to Maud de Braose, Baroness Mortimer, wife of Roger Mortimer, first Baron Mortimer, in 1248. 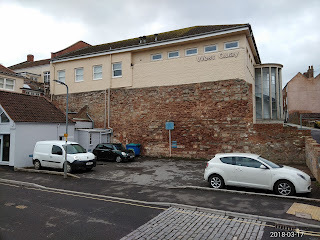 It was inevitable then, that the castle became embroiled in the second Barons War (1264 to 1267) Roger Mortimer was a staunch supporter of Henry III, and held the area for King and Crown. Above. 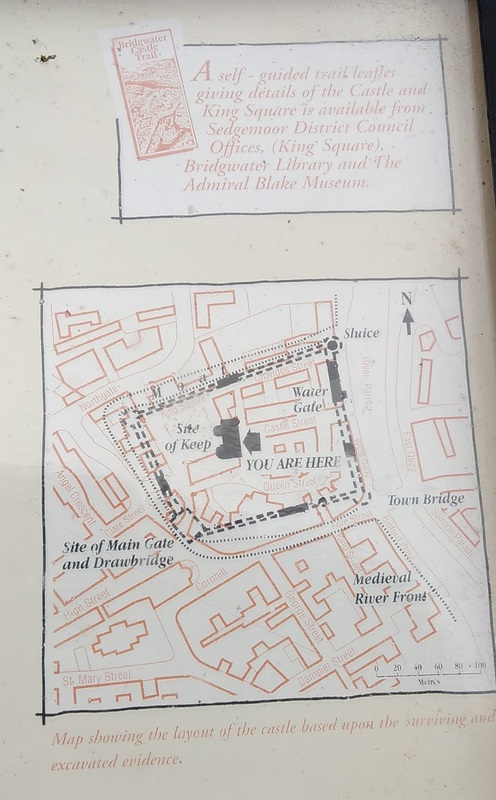 Portion of the castle information board, showing the layout of Bridgwater Castle. The castle passed into the hands of the Crown again after 1321, until 1326, when it was used as a base by Edward II in the Despenser war, fought between Edward II and the Marcher Lords. The castle was later returned to the Mortimer family, but was neglected for a number of years, with portions of the moat filled in, and materials robbed from some of the buildings. Only St Mark's chapel was maintained and repaired. Above. A portion of the information board. In the 1380s and the 1390s, towers, gatehouse and keep were repaired and re-fortified. By 1450, private houses had been built within the walls, echoing the urbanisation of York's city walls later in their life....restored but adopted into every day non-military life. In the 1540s, a house had even been built on the site of the now derelict and much decayed keep. Once again, the castle fell into the hands of the Crown, with Charles I granting ownership to George Whitmore (Lord Mayor of London in 1631) in 1626. Whitmore sold the castle and grounds to Henry Harvey, who built his house within the remaining walls....demolishing more masonry to make way for his comfortable abode. 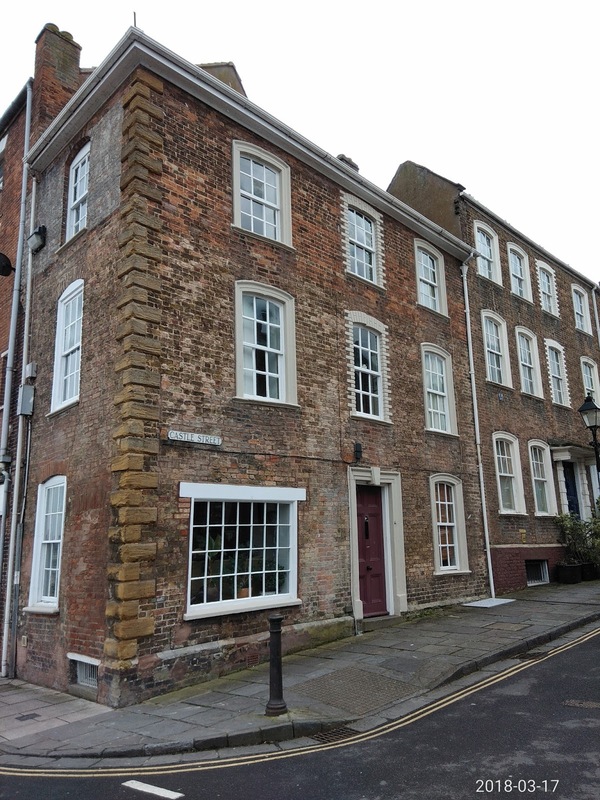 The house was then leased to Colonel Edmund Wyndham in 1643. 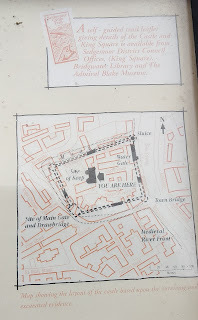 By this time, the English Civil War had broken out, and the town and castle were seen to possess some military value....both town and castle were garrisoned by Edmund Wyndham for the Royalist cause. Inevitably the town and castle were laid siege to by Cromwell's forces....legend has it that Edmund's wife, Lady Crystabella Wyndham fired a musket at Cromwell from the walls....narrowly missing him and killing his aide-de-camp. After a destructive siege of town and castle, Wyndham surrendered, and Cromwell's troops moved in. Wyndham however, was able to organise Charles II's exile to France soon after. 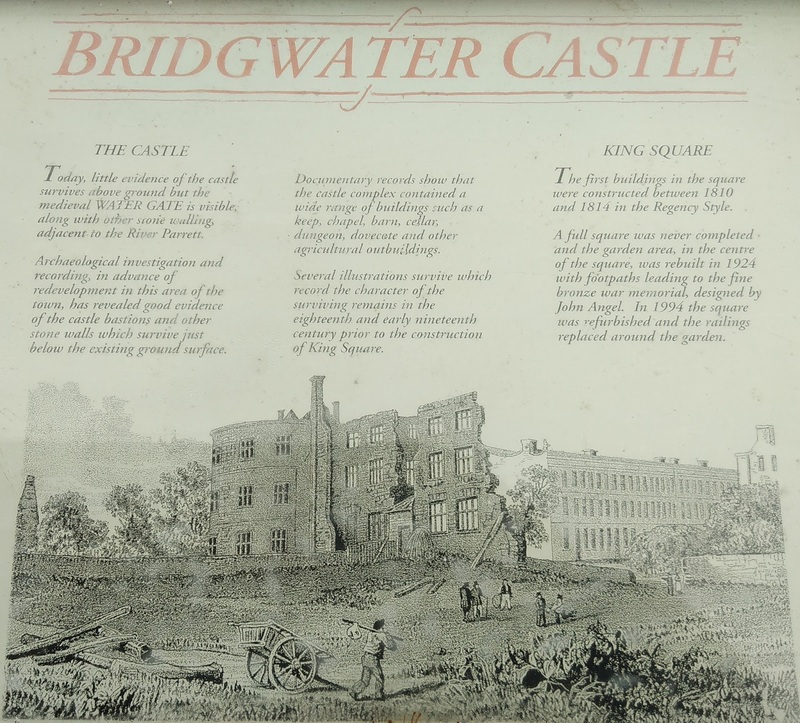 The already badly damaged castle was further slighted by the Parliamentarian victors, though historical eye-witnesses of the time testified that much of the fabric of the castle had already been destroyed. Whatever was left, and whatever was further destroyed, is pretty much what we see today....scant remains that have been incorporated into buildings, both above and below ground. 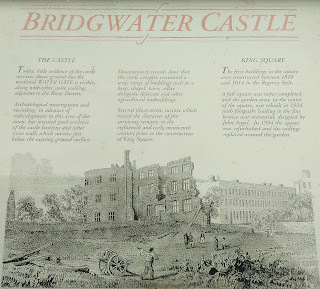 The history of the castle remains rooted in the past.....though Bridgwater continued to thrive and expand. The town is well worth exploring, along with the river side walks, which still bear the scars of World War II, with pill boxes scattered along it's banks.